Heat a medium skillet over medium. Add the bacon and cook until rendered and crispy, 6 minutes. Remove from pan and place on some paper towels to soak up the fat. Drain all but 1 tbsp. bacon fat. Once bacon has cooled, chop it into crumbles. Add the grated sweet potato to the pan, and season with cumin, chili powder and a pinch of salt and pepper. Saute potatoes until they soften and are browned on all sides, 8 minutes. Scoot the hash browns to one side and add the spinach. Cook to wilt, 2 minutes. In the meantime, bring a small saucepan to a boil. Add the egg, cover and boil for 6 minutes. Remove with a slotted spoon and gently peel the shell under cool running water. With only 6 minutes you'll end up with a soft boiled egg. Add two minutes for a thicker yolk, and go a full 10 to 12 for a hard boiled. Arrange the hash browns in the bottom of a small bowl. Place the spinach on top, followed by the egg, split in half. Garnish with another small pinch of salt, black pepper, the crumbled bacon and the torn basil leaves. I, for one, could eat breakfast 15 times a day. At least. It's the ultimate chance to combine my favorite textures and flavors into one heckuva power blast for my mouth. One of my most favoritest breakfasts evar in the world and universe is this super simple breakfast bowl for one. It features sweet potato (holla!) hash browns seasoned with ground cumin and chili powder, wilted spinach (I'm on the verge of creating an edible wig out of this stuff. 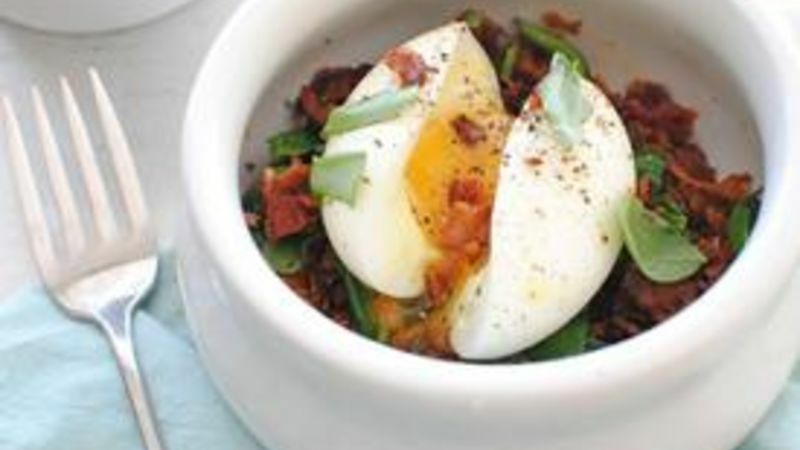 Stay tuned), a wonderfully succulent soft-boiled egg (nothing.better.in.life.) topped with torn basil and crispy bacon crumbles (do you need me to hold you?). I could sit here and try to tell you about the gymnastics that will be occurring within your soul cavity as the runny yolks gently ooze over the soft yet crispy hash browns and velvety spinach. And how the crunch of the bacon and the perfect pungency of fresh basil adds just the right amount of depth and texture that will send you falling straight up out of your chair. Yeah, I could go into all that, but that would be wasting precious time when we COULD BE EATING THIS. We have bacon, an egg, a sweet potato, spices, spinach and basil. Mmmm. Grate up your sweet potato with a…grater. I only used half of mine. Render the bacon until nice and crisp-ay. Drain off all but about a tablespoon of the fat, if you even need to. Set the bacon aside for a kiss. Add the hashies to the skillet. I just said hashies for the first time ever. Not sure what I think about this. Scoot over the taters, and add the spinach to wilt. That stuff almost disappears! Which is horribly tragic. Layer your hash browns and spinach in a bowl (or plate or mug or ramekin or OR OR). In the meantime, bring a small saucepan to a boil. Add the egg and boil for 6 minutes. Don't fugget about ze bacon. Crumble, crumble, crumble. Once you've removed the shell, place the egg over the hash browns and greens and cut into it. The moment we've all been waiting for. Runny yolks govern my soul. You know what, don't even wear a bib. Now go make this before I collapse from bliss exhaustion. Bev has had time to think about the word hashies. It can stay. For more musings visit her blog Bev Cooks and her Tablespoon profile.